For our second example, we will create a run for a longer passage, using the same principles we used earlier. 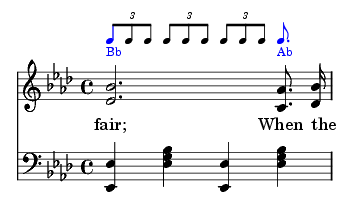 This run will be placed on the first beat of the fourth measure, at the word “fair”. Again, since triplets are characteristic of the evangelistic style, they will be our rhythm of choice for this run. The word “fair” is held for three beats, and the number of triplets in three beats is 9 (3 x 3 = 9), but this does not mean that you will use 9 triplets in your run. Since the first triplet of the measure is Bb (the melody note), you will probably have to begin your run on the second eighth note triplet of the first beat. 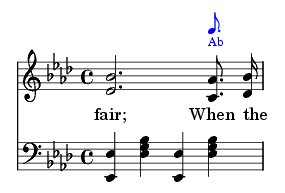 The eight chord tones preceding the target note, Ab, are: G, Ab, Bb, C, Db, Eb, F, and G. Since the underlying chord is Eb, the starting note G will work well for this run. Play this run as it would appear in the music. 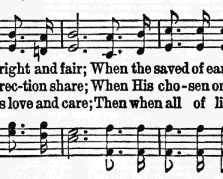 As is common with runs in the evangelistic style, this would sound better if played on octaves. You can also see that this run can easily push the melody an octave higher, making it a good transition from the basic style of hymn playing into the right hand octave style of playing. Remember to keep the O/C steady as you play!